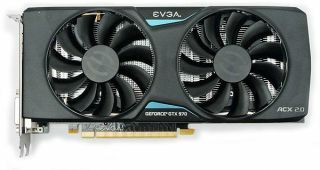 Newegg is currently running a nice deal for an overclocked EVGA GeForce GTX 970 graphics card for $310 (normally priced at $340). That's a decent savings, but the card also comes bundled with a copy of Tom Clancy's The Division, which is free money if you're already planning to buy the third-person sh-mmo-oter. This card is the SuperSC ACX 2.0+, which comes with full overclocking support and EVGA's quiet ACX 2.0 cooler. This GTX 970 has 4GB GDDR5 memory, a core clock speed of 1190MHz and a boost clock of 1342MHz. These specs are pretty close to the slightly more powerful version of EVGA's GTX 970 which has a core / boost clock speed of 1216 / 1367MHz. These retail for $360, so you're saving $50 and getting a new game for only a slightly less powerful card, which you can of course overclock more yourself. Most GTX 970s currently go for between $320 and $400. Newegg is also offering a copy of The Division with other Nvidia cards, from GTX 970s up to the GTX 980 and 980 Ti. The Asus GTX 970 with a core clock of 1114MHz is currently $10 off, taking the price down to $340. You also get a $20 rebate card in addition to a copy of The Division. Gigabyte's equivalent card has a similar sale, except you get $20 off the original price taking it down to $330. If you want to go more powerful, you can get EVGA's GTX 980 Ti for $620, plus a copy of The Division and a $20 rebate card. And if you're already set on a GPU, Logitech's recently unveiled G810 Orion Spectrum also comes with a copy of The Division. There sure are a lot of ways to get The Division for free, huh?